The 55th was a great success! Be sure to check out the photos! Welcome to the York Community High Class Of 1963 web site. So glad that you found us! Now that you are here, look around and let's get this party started! Our 50th reunion is now in the books. What a fantastic occasion! Stay tuned for photos and a few first-hand accounts of the festivities. 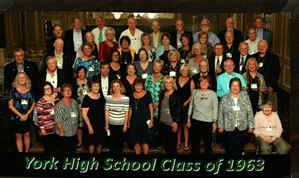 Very special thank you to the reunion committee and volunteers for their efforts, but most of all to you, the Class of 1963! You are a very special group! Please update your profile. You can come back and change your profile information as often as you like. We will add your Senior picture when you update and we hope you will post a recent picture of yourself and/or family as well. Content copyright 2013. 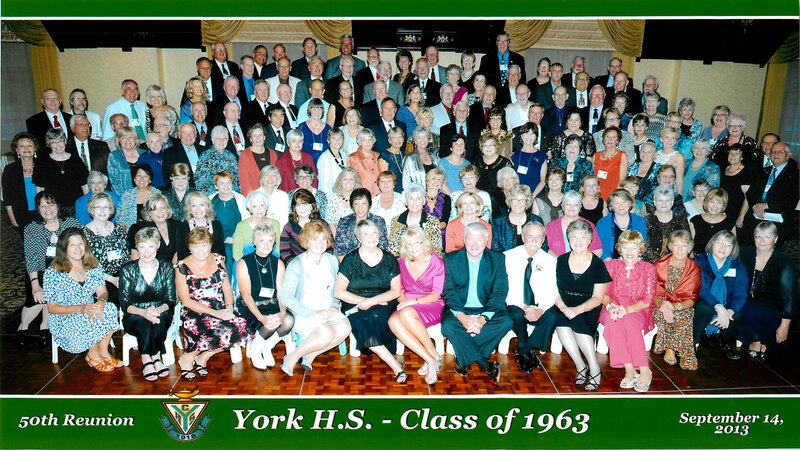 York High School Class of 1963. All rights reserved. Admin note: I have made the music option, just that, an option. When you log on, you should receive a pop up inquiring if you want to play music or not. If you answer in the affirmative, the player will open in a small window and randomly go through the playlist. This allows you to surf the rest of the site without having two tabs open. If for some reason, the pop up doesn't appear, about halfway down the main page is a link to activate the music. Either one works. Enjoy! The website has a feature to recognize classmates who have served in the military. We would like to expand that a bit to include anyone who served their country in the Peace Corps as well. Just utilize the feature in your profile for military and where it has the field for a branch, simply type in Peace Corps.